Brooklyn has a home! 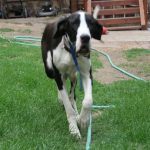 - Rocky Mountain Great Dane Rescue, Inc.
Brooklyn has a home with her new Dad, Reese, in Littleton, CO! Brooklyn will be the first Great Dane for Reese, but he has friends who own Danes, and has spent lots of time falling in love with the breed. Reese works from home, and has no other pets, so Brooklyn will have round the clock attention. She and Reese will go for walks on the greenbelt outside his house, an occasional hike, and just spending lots of time enjoying their new life together. We are very excited for Brooklyn! Way to go sweet girl!